I have done a lot of work over the last several years to bring all of this information on the Canadian Navy together. However, all of this work would be for nothing if it wasn't for a large number of people and other sources (books, magazines, etc.) who have sent me information and photos. This is the section where I will try to acknowledge those people and sources. is formatted similar to, "The Ship's of Canada's Marine Services" by Doug Maginley and Bernard Collin. colour photographs of the Navy's newest ships. Navy, and this is the best place to start! Jim Allison for providing several photos from his time in the RCN during WWII. informed on the various naval happenings in Canada. them, although they may be credited to other parties, such as DND. Bill Croshaw for scanning a number of excellent photos. Bill Dougherty for providing some photos from his time in the RCN. Dan Murphy for the pictures in the Maggie feature. Chris Preston for the tour of HMCS TORONTO. Aaron Sams for letting me borrow his scanner for extended periods. David Shirlaw for information and scanning many of the photos I have displayed here. for providing countless details and photos. own and loaned me badly needed disk space at times. Steve Wilton, for providing me with a number of the photographs seen in these pages. Barrie, Ron and Macpherson, Ken. (1996). Cadillac of Destroyers: HMCS ST. LAURENT and Her Successors. Canada's Navy Annual. Corvus Publishing Group (various editions). Harbron, John D. (1993). The Longest Battle: The RCN in the Atlantic: 1939-1945. Jane's Fighting Ships of World War I. (1919, 1990). Studio Editions Ltd. London. Jane's Fighting Ships of World War II. (1947, 1995). Studio Editions Ltd. London. Lynch, Thomas G. (1981). Canada's Flowers: History of the Covettes of Canada 1939-1945. Maginley, Charles D. and Collin, Bernard. (2001). The Ships of Canada's Marine Services. Macpherson, Ken. (1985). The River Class Destroyers of the Royal Canadian Navy. Charles J.
Musson & Associates. Toronto, Ont. Publishing Ltd. St. Catherines, Ont. Macpherson, Ken. and Barrie, Ron. (2002). The Ships of Canada's Naval Forces 1910-2002. Macpherson, Ken. and Burgess, John. (1993). 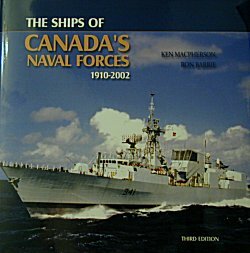 The Ships of Canada's Naval Forces 1910-1993. Macpherson, Ken and Milner, Marc. (1993). Corvettes of the Royal Canadian Navy 1939-1945. McKee, Fraser. and Darlington, Robert. (1996). The Canadian Naval Chronicle 1939-1945. Miller, Commodore Duncan (Dusty) E., and Hobson, Sharon. (1995). The Persian Excursion. Mills, Carl G. (1991). Banshees in the Royal Canadian Navy. Banshee Publication. Willowdale, Ont. Milner, Marc. (1999). Canada's Navy - The First Century. University of Toronto Press. Toronto. Perkins, J. David. (1989). Canada's Submariners 1914-1923. The Boston Mills Press. Perkins, J. David. (2000). The Canadian Submarine Service in Review . Schull, Joseph. Far Distant Ships: An Official Account of Canadian Naval Operations in World War II. and approximations of what they looked like during at least one part of their careers. have reliable internet access due to the nature of his job, and may be late in replying to e-mail. Copyright © 1997-2003, Sandy McClearn. All Rights Reserved.